On behalf of a large coalition of local interests, Crag Law Center recently challenged a major expansion of the Tesoro oil refinery in Anacortes, Washington. Tesoro wants to produce a new fossil fuel-based product—mixed xylenes—that would be manufactured from crude oil and then shipped to Asian markets where it would be turned into plastics or other similar products. The xylenes themselves contain a suite of carcinogenic and toxic chemicals found in crude oil, like toluene and ethylbenzene, and the production process involves large quantities of other toxic chemicals, including sulfolane and aqueous ammonia. The expansion project would cost $400 million, and Tesoro hopes to produce 15,000 barrels per day of xylene or 230 million gallons per year. To give you a sense of the size of the project, the United States currently exports a total of 15,000 barrels per day of mixed xylenes, mostly from Texas—meaning that this one project could double existing exports of the petrochemical product. All 230 million gallons of the xylenes would be loaded onto marine vessels at Tesoro’s aging wharf in Anacortes and then shipped through the busy traffic lanes of the Salish Sea. Skagit County issued a shoreline development permit to Tesoro because the project requires that new infrastructure be installed on the wharf on state-owned tidal land. Crag represents a diverse group of local and regional organizations working to protect the San Juans for local people and businesses. 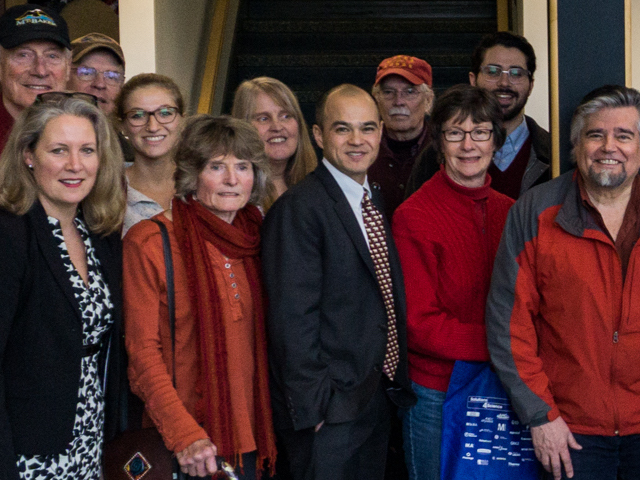 Crag filed an appeal of the shoreline permit for Stand.earth, RE Sources for Sustainable Communities, Friends of the San Juans, Evergreen Islands, Friends of the Earth, and the Sierra Club. Our clients contend that Skagit County cut corners in how it conducted the environmental review for the project, ignoring the significant safety risks posed to local communities in and around the Salish Sea. A major accident involving millions of gallons of xylenes and fuel for the vessels could cut off isolated island communities for days or weeks at a time, interfering with emergency response services and other basic community needs. The project would also be a major emitter of greenhouse gases, with emissions of more than 3 million tons per year involved in production, transportation, and use of mixed xylenes. Despite these risks, Skagit County decided to look only at the very narrow impacts of the discrete equipment installed on the wharf, artificially blinding itself to the broader environmental harms. In the big picture, this project is just one more way for the oil industry to get its dirty crude oil products to market. The Salish Sea is under attack from a number of fossil fuel projects that will dramatically increase the risk of a major accident in habitat for orca whales, salmon, marine mammals, and seabirds—thereby threatening a vibrant local economy dependent on outdoor recreation and tourism. Crag is proud to represent local communities in their work to protect the natural resources of the Salish Sea and to ensure that they have a meaningful voice in decisions that impact their futures.